First up in Fugly Week is this offering from Office. They call it Lethal Fringing. I call it Fugging Lethal. It's definitely a case of Too Many Trends happening in one shoe. Fringing? Check. 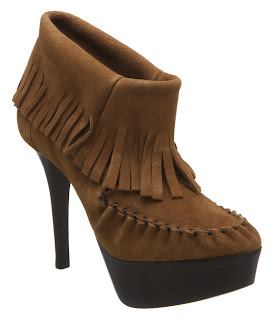 Moccasin stylings? Check. Platform? Check. Shoeboot? Check. Sadly I can see them being a favourite in magazines, 'styled' in some sort of urban folksy cowboy ensemble featuring a maternity tunic belted in with, oooh, 3 belts, fringed suedette waistcoat and stonewash denim hotpants and splashed with "SO HOT RIGHT NOW!!!" fawnings. Ugh. If this actually becomes a reality, I will officially renounce women's magazines forever. If you want to take a closer gawp in a freak show kinda way then do so here or in store. Don't blame me for any damage to your retinas caused by prolonged exposure to such fug. Yowch, my eyes, my eyes. They're bleeding and the flow cannot be staunched. I have been stabbed by a fugly knife owned by whoever invented these shoes. They are dee-sgusting. I agree - this is urban cowboy gone horribly wrong. Also, they look painful.